It all started with Chris Abrahams weaving a delicate melody upon which Tony Buck added shimmering bells and steel drum, with only sprinkles of bass from Lloyd Swanton, and for a while, this constituted the core of the performance, but the tone got darker with bowed double bass, and what was initially an airy solo motif on the piano turned into a more monolithic sequence as Abrahams switched to a hypnotic theme, with contrasting clusters of notes in the higher and lower registers, his finger repeatedly rippling on the same parts of the keyboard. Meanwhile, Buck was layering a pretty complex sonic mesh from his vast panoply of percussions. As the pace slowed down and the intricate cloud of sounds generated by the trio slowly dispelled, all was left for a moment was Buck repeatedly hitting a small cymbal then placing it on a drum to capture it’s resonance, opening up for the other two to build up a second, much more subtle and less intense, wave, led by Abrahams’s extremely fluid piano, until everything but a clatter of bells was left. After a break, the three returned to their instruments, in silence, waiting for one of them to grab the moment, and it was Buck who, having closed the first set, opened the second, with another clatter, this time of wooden objects, to which he added a growing tide of waves as he gently swiped brushes on his snare drum, a motif which was mirrored later by similar cyclical sequences on the piano and bass. This second set found the trio in equally reflective mood as they continued to slowly build upon these recurring patterns. It was, a while in, Swanton’s turn to take prominence over his fellow Neckers, increasing up the pace and adding energy as he leant over his double bass at first, then straightened up, frantically bowing to draw grave earthy tones from his instrument, as Buck and Abrahams joined him in a frantic chase. It was time for him to pull back and integrate the Necks triumvirate once more as the music reached its most intense peak of the evening. This second half proved more linear in progression, reached its cruising pace much sooner and stayed there for some time, as wave after wave of piano, bass and drum came washing over the audience. But, soon enough, all was left for the trio was to wind it all down until Abrahams was again on his own, to conclude, almost as he had started a couple of hours earlier. 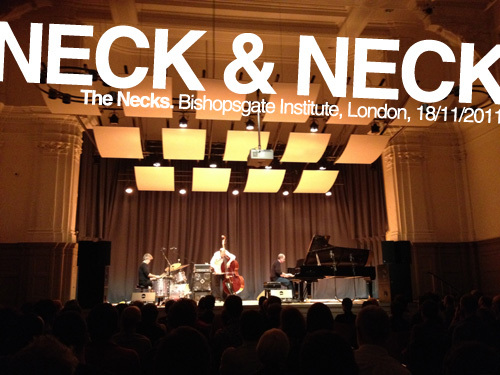 Watching The Necks play is always a fascinating thing. Despite never once making eye contact, they work in extreme symbiosis, taking it in turn to lead, almost imperceptibly as the music evolves slowly, organically, responding to their respective alterations or change of direction. For this first of two evenings in London, Chris Abrahams, appeared to opt for somewhat introspective sets, which both grew into extremely intense and fluid moments as only The Necks can muster.